This post is in partnership with Zonderkidz. 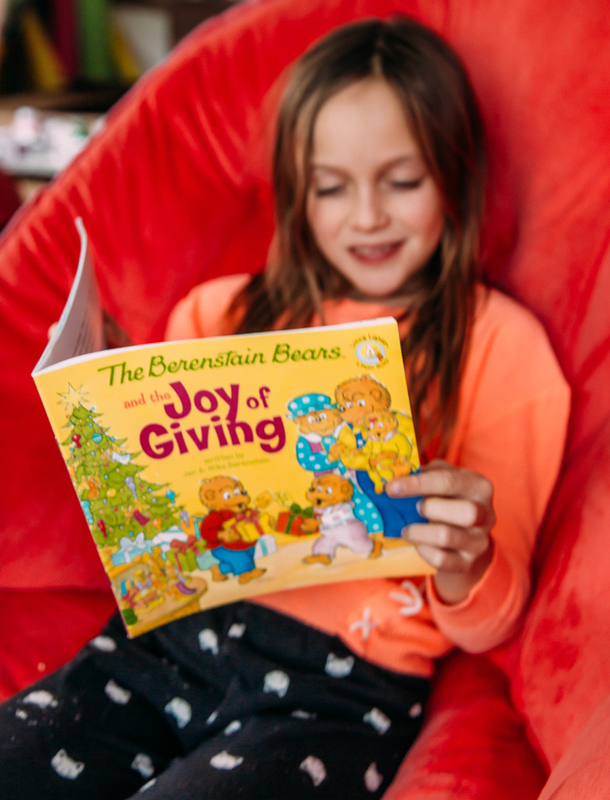 This year to encourage the spirit of giving, we’ve been reading The Berenstain Bears and the Joy of Giving By Jan & Mike Berenstain (in stores now, released September 2010) together and talking about how giving really does end up bringing us all joy. In the book, Brother and Sister Bear can’t wait for Christmas and all the presents they’ll open. But during the Christmas Eve pageant, something special happens! The Bear cubs learn a very valuable lesson about the joy of giving to others. We give in a couple ways this time of year, but one of the ways we decided to make it tangible as a family is to stuff stockings for kids in need. This is so simple to do and a great way to get your family or classroom involved in giving during the holidays. To create your own giving stockings, call a local family shelter, teen home or you could even make them for a local nursing home and ask how many you can bring by. You can also ask if there’s any special needs you could include. 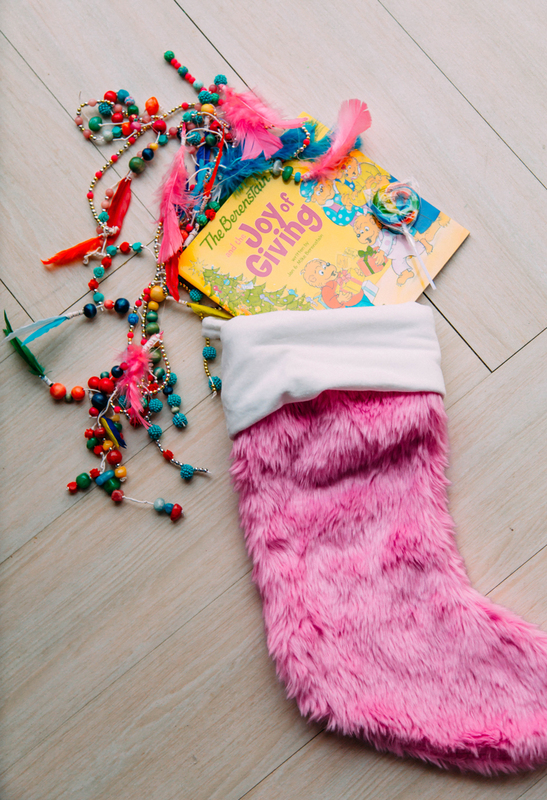 Buy that many stockings and take the kids to pick out 5-7 gifts to fill each one. If doing this with a large group it’s even easier – assign each kid one stocking stuffer to bring in and then everyone stuffs them together! The last step is just to deliver and drop off the stockings. We recently did this for a local teen shelter and filled the stockings with things like lip gloss, nail polish and teen focused books. It was super fun and we blessed a whole bunch of girls with the giving. Here are a few other great causes that you can get the kids involved in giving to this season. Our church does a huge gift every year that we participate in to dig new wells for clean water. It’s such a worthwhile cause and affects kids around the world. Find out more here. Get the kids involved with sponsoring a child this year. They can help write notes, send drawings etc. It’s a great way to talk about giving in action. The kids can support other kids having safe and clean playgrounds (something I know my kids would get behind!) through Kaboom. And lastly, supporting your local Angel Tree is a great way to get the kids involved in picking out Christmas presents for someone besides themselves this time of year. 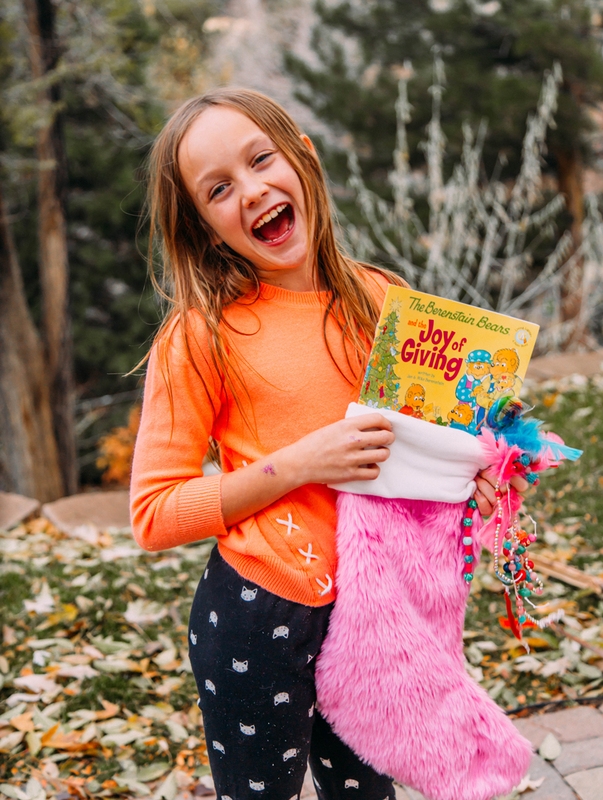 I love books that help our kids understand the joy that comes not just from receiving this time of year, but more importantly from giving, like The Berenstain Bears and the Joy of Giving. What giving traditions do your families hold for the holidays?